One of the great shade plants for dry area are the Epimediums, they thrive in shade, flower and will form a dense matt over time that makes the useful as a ground cover plant. 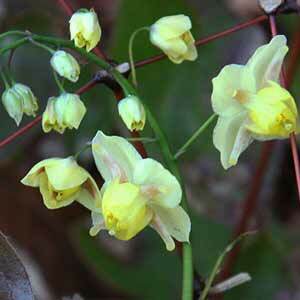 Epimedium plants are also known as ‘Barronwort’ and are mostly from Southern China and make an excellent garden plant. Valued for the ability to grow in deep shade Epimediums are also sought for both foliage and flowers which form in spring. All species make great ground cover beneath deciduous trees, with flowers in early spring through to summer they can also be used in the rock garden or as border plants. Epimedium Rubrum, grandiflorum, and sagittatum are all popular species, however with dozens of species and hybrids available, foliage and flower colour differs greatly. Pictured right is the very pretty species Epimedium accuminatum. 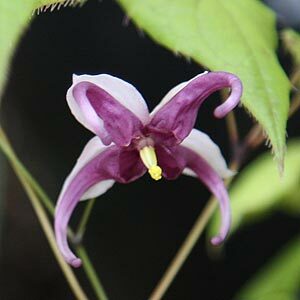 Epimedium perralchicum ‘Frohnleiten’ is readily available however many other interesting species can be found for sale from specialist suppliers. E. leptorrhizum has some of the largest flowers of all. Epimedium pierres ‘purple’ is a popular mid sized cultivar. Apply organic mulch in winter for best results. With yellow, white and pink flowers these are a fairly tough plant and mix well with Aquilegia. Epimedium sagittatum is known as Horny Goat Weed. Epimedium x versicolor-‘Sulphureum’ (pictured left) is one of the prettiest yellow flowing Epimediums we have seem. And as for bold foliage, and we are not just talking about autumn colour, try the Spiny Leafed form of the rare, and therefore fairly expensive Epimedium wushanense. Large leaves with prominent spines along the edges. Although these are really a plant and forget ground cover, a little extra care will have them looking great. Plant in a humus rich soil in light to dappled shade. Water in well with a liquid seaweed fertiliser and take care to water through the first summer. After this Epimediums will be surprisingly drought tolerant if grown in shade. Mulch around newly planted varieties to maintain some moisture and a cool root run. You can prune these plants back the ground in winter, this allows the flowers to be shown off to their full extent, it also refreshes the foliage. After pruning, mulch and liquid fertilise. We like to mix a little aged cow manure and blood and bone in with the mulch. Epimediums do like shade, here are few other shade loving plants worth considering. Acorus, Ajuga reptans, Astilbe, Clivia, Dicentra, Helleborus, Heuchera, Hosta, Hydrangea, Lily of the Valley, Saxifrage, Solomon’s Seal.